The Prime Minister of Albania (Albanian: Kryeministri i Shqipërisë), officially styled the Prime Minister of the Republic of Albania (Albanian: Kryeministri i Republikës së Shqipërisë), is the head of government of the Republic of Albania and as well the most powerful and influential person in Albanian politics. The Prime Minister holds the executive power of the nation and represents the Council of Ministers and chairs its meetings. The Prime Minister is appointed by the President of Albania after each general election and must have the confidence of the Parliament of Albania to stay in office. The Council is responsible for carrying out both foreign and domestic policies. It directs and controls the activities of the ministries and other state organs. The Prime Minister is elected on the basis of universal suffrage, through a secret ballot, for a four-year term. The Constitution of Albania sets no limit as to office terms of the prime minister. The 33rd and current officeholder is Edi Rama of the Socialist Party who was elected on 23 June 2013 and started his first four-year-term on 15 September 2013. One important role of the President is to designate a candidate for the office of Prime Minister who, in the opinion of the President, is best able to command a majority of the members of the Parliament. As head of government, the Prime Minister is charged with directing the internal policy of the country and leads the public administration. In this regard, the government cooperates with other interested social actors. If the Prime Minister is temporarily absent or incapable of exercising its executive power, the Deputy Prime Minister takes over his functions, such as chairing the cabinet and the council of ministers. 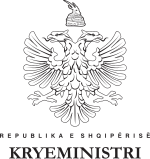 The Constitution states that the Prime Minister represents the council of ministers and chairs its meetings, outlines and presents the principal general policies of the state and is responsible for them, assures the implementation of legislation and policies approved by the Council of Ministers, coordinates and supervises the work of the members of the Council of Ministers and other institutions of the central state administration, performs other duties contemplated in the Constitution and laws, resolves disagreements among ministers, and issues orders in the exercise of his powers. The Prime Minister can also initiate a proceeding of the Constitutional Court of Albania. The Prime Minister's Office (Albanian: Kryeministria) is the official office and residence of the Prime Minister. It provides secretarial assistance to the Prime Minister. The Prime Minister through his office coordinates with all ministers in the central union cabinet, minister of independent charges and governors and ministers of state government. Furthermore informal meetings between the prime minister and other government or foreign officials takes place in the Office. It also consists of the immediate staff of the Prime Minister of Albania, as well as multiple levels of support staff reporting to the Prime Minister. Since 1941, the building serves as the office and residence of the Prime Minister. The building is in the capital city of Tirana at the Dëshmorët e Kombit Boulevard, near the Mother Teresa Square. The building was planned by the Italian architects Florestano Di Fausto and Gherardo Bosio, and constructed together with the Dëshmorët e Kombit Boulevard, the Mother Teresa Square and all the buildings located on these squares, during the Italian occupation of Albania in 1939 to 1941, in a Rationalist style. ^ "1998 CONSTITUTION OF THE REPUBLIC OF ALBANIA". osce.org. p. 19. At the beginning of a legislature, as well as when the position of Prime Minister is vacant, the President of the Republic appoints the Prime Minister on the proposal of the party or coalition of parties that has the majority of seats in the Assembly. ^ "1998 CONSTITUTION OF THE REPUBLIC OF ALBANIA". osce.org. p. 19. Before taking office, the Prime Minister, the deputy prime minister, and the ministers take an oath before the President of the Republic. ^ Dervishi, Kastriot (2012). Kryeministrat dhe ministrat e shtetit shqiptar në 100 vjet. Tiranë: Shtëpia Botuese "55". p. 273. ISBN 9994356224. ^ Pearson, Owen (2005). Albania in Occupation and War: From Fascism to Communism, 1940-1945. London: The Centre for Albanian Studies. p. 1982. ISBN 1-84511-014-5.